An architect, painter and art educationalist, he is remembered chiefly as �one of the most important contributors to [the city�s] art scene that Glasgow has witnessed�. He was born in London, the son of Andrew Wilson, the landscape painter and art importer, and, after intense study of ancient architectural ornament in Italy, he returned to Britain in 1833, and eventually became Director of the Schools of Design in London, 1843-48. It was in this capacity that he co-founded, together with John Mossman and others, the world renowned Glasgow School of Art (then known as the Glasgow School of Design) in 1843. As its headmaster from 1848-63, Wilson was in close contact with the Mossmans who were teaching many of the sculptors and carvers who produced the bulk of the city's architectural sculpture and monuments in the Necropolis, and who studied their craft at evening classes held in the school�s original home in Ingram Street. Wilson was also involved with the creation of another of the city�s great institutions, the McLellan Galleries, whose treasures formed the nucleus of Glasgow�s civic art collection, in 1856. One of his most controversial projects, however, was the re-glazing of Glasgow Cathedral with a spectacular series of windows manufactured in Munich, rather than by Scottish artists, from 1859-64. 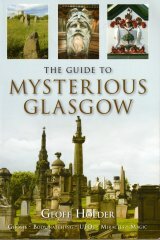 As an architect, he is known for a handful of works in Glasgow, including two monuments in the Necropolis, and for regularly being confused with his contemporary, the great Glasgow architect Charles Wilson , with whom he shared no other relationship than having the same name and through their professional associations. After resigning from the art school, he returned to full time practice as an architect in 1864, opening an office at 29 St Vincent Place, and formed a partnership with a former pupil, David Thomson, who (co-incidentally) had been the partner of Charles Wilson until the latter�s death that same year. One of their projects was the �very elegant and carefully designed monument� to the painter John Graham Gilbert in the Necropolis (1867), featuring a marble portrait by William Brodie , which followed the unadorned obelisk to Henry Monteith of Carstairs, of 1848, in the cemetery�s Gamma section, by the Mossmans, which predates his work with Thomson. Elsewhere, he produced an unsuccessful design for the Nelson Monument in Trafalgar Square, London (c.1840); executed alterations to Sir William Stirling�s Broomhall in Fyfe (1863-6); designed the Duke of Hamilton�s fountain at Hamilton Palace, Cadzow; and a monument there to the IIth Duke of Hamilton, which features a colossal bronze bust by John Mossman (1861). In Glasgow, his work with Thomson includes the redesign of the interior of the McLellan Galleries (c.1868, destroyed, 1914). Returning to Italy in 1868, Wilson worked with the Florentine sculptor Odoardo Fantacchiotti (1809-77) on a seven marble memorials for Stirling Maxwell�s Lecropt Kirk, near Bridge of Allan. These include the monument to Lady Maria Leslie Melville, and all feature portrait busts. He was also an author and illustrator, contributing etchings to James Wilsons' Voyage Round the Coasts of Scotland, in 1842, and publishing his own volume on the Life and Works of Michelangelo Buonarotti, in 1876, for which he received the cross of the Corona d�Italia from the King of Italy. Wilson spent his latter years in Florence where he was at the centre of a large circle of writers and artists. He died on 3rd July 1882. In 2000, Wilson was the subject of an exhibition on his life and work held at Glasgow School of Art, Missionary of Art: Charles Heath Wilson 1809-1882. This was accompanied by the publication of the book Missionary of Art (ed: Rawson), which contains his portrait, and is lavishly illustrated with examples of his paintings and designs.